I like variety. Sure, sometimes during the week I can get on a kick and eat the same thing every night for dinner (hellooo, lima beans, I’m lookin’ at you), but I also really appreciate mixing it up every now and then. That’s why a few months ago when I decided I wanted some breakfast cereal, I went to the store and bought about 8 different boxes of the stuff. Each morning needed to have its own flavor — as long as the nutrition facts were acceptable. What? Don’t look at me like that. Sure, I may be the same girl who posted the Coffee Cookie Dough Fudge Cheesecake, but I do try to eat reasonably during the week! The store-bought cereal was okay. At least, I thought it was okay at the time. But then something happened — I had one of those thunderous BIG IDEAS. It all started when I was perusing one of my favorite blogs, Not So Humble Pie, and saw her (you’re not going to believe it) S’mores Candy Bar. I know. Insane. The premise of her post was that she didn’t understand the excitement over this new company that makes customizable candy bars, since it’s so easy to make them at home. Having been excited about the customizable candy bar company, I felt admonished. And inspired. Because even more than I had been excited about customizable candy bars, I was excited about customizable cereal. There’s this company on the web (I won’t link to them, since I’m about to tell you it’s silly to pay for their product) that allows you to choose all the ingredients you want in your own personal box of cereal — and even lets you pick a name for your new creation! Too fun! BUT. I realized when I read Mrs. Humble’s candy bar post that it didn’t make any sense to pay for one kind of customized cereal (that was just like going to the grocery store), or even for eight kinds of customized cereal . . . what would really make sense is to make your own fully customizable cereal buffet — one that would allow you to have a different flavor every day if you wanted to! A dream was born. I scrounged up recipes for homemade granola and nutty bran flakes (I’ll gush about these in a minute). And as if to emphasize that making homemade cereal was indeed my destiny, the folks at Oh! Nuts emailed to ask if I’d like to review some of their products. Uh, YES, NUT PEOPLE, YOU READ MY MIND. Pounds of nuts and dried fruits later, I was in the cereal-makin’ biz. If you’re about to post a comment calling me a hippie for making my own bran flakes, hold it right there. This recipe is super easy, super cool, and super rewarding. You feel like a superhero (who makes their own cereal?! I MAKE MY OWN CEREAL! I AM CEREAL WOMAN! ), you know exactly what healthy ingredients went into said cereal, and — this is the best part — you have bran flakes that don’t taste like a cardboard box. Every time I opened the jar they were stored in, I got a whiff of delicious nuttiness. They had texture! They had taste! Yes! The granola is the flavor that really carries the cereal, though. I chose a Double Coconut Granola from Opera Girl Cooks that I’d heard a ton about. Once it cooled, it lived up to the hype — buttery, slightly sweet, coconutty, with a hint of salt to really amp it up. Once you’ve made some flakes and granola, the fun starts. Possible add-ins are endless: dried fruits, fresh fruits, toasted nuts (do make sure to toast them — MUCH more flavor), seeds, chocolate chips, peanut butter or cinnamon chips, candy, marshmallows . . . be creative! Add a little, add a lot. My favorite bowl was a straight-up combination of all my options: bran flakes, double coconut granola, dried cherries, dried blueberries, cinnamon pecans, and toasted walnuts. If you have just 2 dried fruits and two nut options along with your flakes and granola, you’ll have 48 possible breakfast cereal varieties — that’s a lot of options! The Oh! Nuts products were a success in terms of taste — the blueberries had a pronounced, wonderful blueberry flavor, and the cinnamon pecans were so addictive that I almost ate my stash before I got my cereal made! The sour cherries did have an odd, slightly fishy flavor (I know, weird), but I still enjoyed eating them. Maybe a flavor compound of the cherries came out that isn’t as pronounced when they’re not dried? To be honest, including the price of shipping, I probably wouldn’t spend the extra money to buy regular nuts or fruit from Oh! Nuts, but would just head to the grocery store. That being said, for specialty items or rare nuts/fruits/candies, they’re the place to go. The selection is huge, and the products are high quality. If you, like me, love a big ol’ bowl of hearty, nutty, earthy, crunchy, chewy, flavorful, delicious breakfast cereal — and one that can change with whatever mood you’re in — I hope you’ll make your own personal cereal buffet! 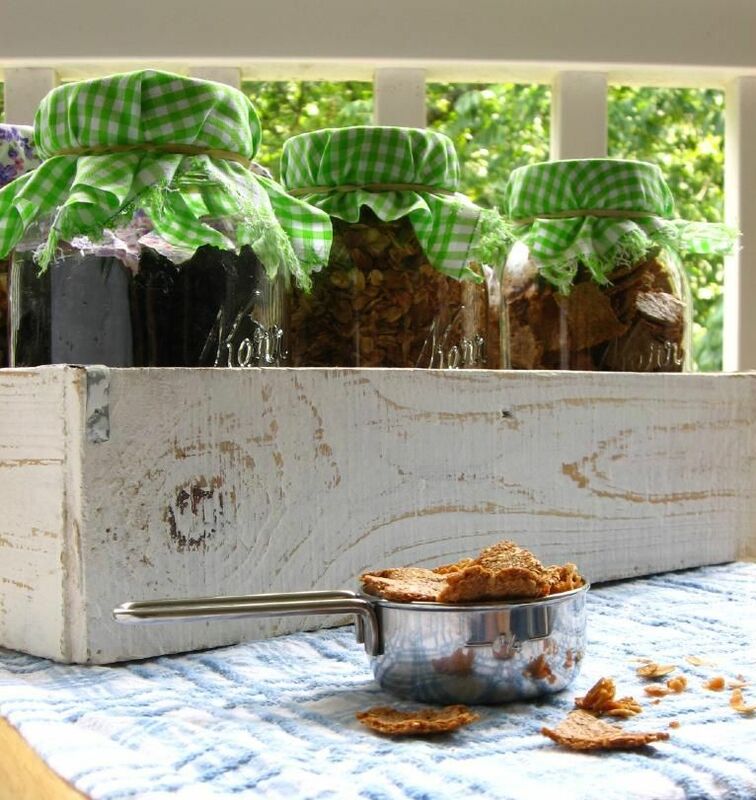 Or perhaps fix a cereal buffet in pretty jars as a gift for a friend. Even better, have a breakfast party: set up a cereal buffet for family and friends where each person can make their own cereal combination, perhaps supplemented with juice and muffins on the side. Have fun! Oh, by the way, I did have to branch out a little in homage to my original inspiration. How about some S’mores Cereal? 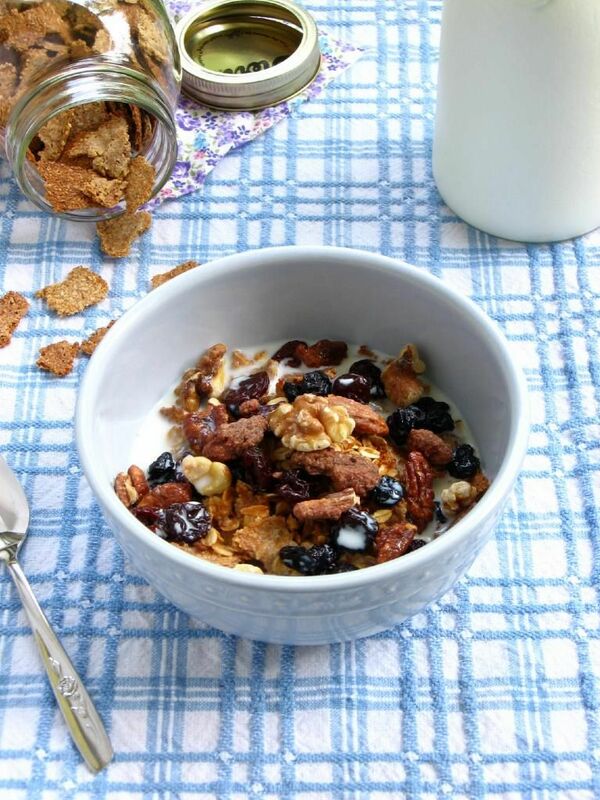 Below you’ll find the recipes for granola and nutty bran flakes. I even included nutritional info so you can make healthy breakfast choices! Round up some of your favorite add-ins and place all the components in separate jars for storage. Enjoy! These flakes are SO MUCH BETTER than the stale boxed kind, you'll be amazed. The only downside is that this recipe uses two full baking sheets and only makes 3-4 bowls of cereal. If you have the stamina for an all-day baking project, I'd grab out all your baking sheets and make a day of it, doubling or tripling the recipe. They really are delicious! Preheat oven to 350 degrees. Sift all dry ingredients into a large mixing bowl and add milk and water. Stir to mix well. The resulting mixture will be a very wet “dough” (so wet, you can hardly call it a dough). Cut two sheets of parchment paper to fit two baking sheets, and set one sheet of parchment paper on the counter where you’ll be rolling — you won’t be able to transfer it without this! Glop half of the “dough” out onto the sheet of parchment paper and flatten it by hand. Place a piece of plastic wrap over the dough and “roll” it out (your rolling pin will almost just be smooshing it out into place) EXTREMELY THIN, almost transparent in some places. It will look like a giant bran flake — super fun! Remove the plastic wrap and transfer the parchment carefully to a baking sheet. Cook for 10 minutes, but check often after just 5, because such a thin dough can easily burn. You’re looking for a thin, leathery cracker that is crunchy at the edges. When it’s done, remove it and allow it to cool completely. While it cools, repeat the process with the other half of the dough. After both giant bran flakes have finished their first bake, reduce the oven temperature to 275 degrees. Tear the first, cooled bran flake into regular bran flake-sized pieces (about 3/4 of an inch), spreading them out on the parchment-covered baking sheet. Bake at the reduced temperature for 20 minutes, flipping and stirring the flakes around every 5 minutes. Repeat process with the second cooled, giant bran flake. Then allow all bran flakes to cool completely. 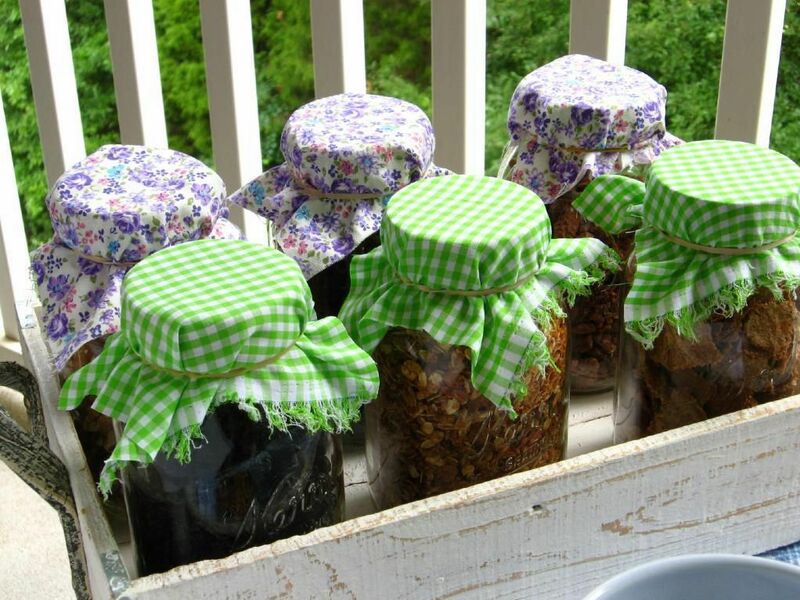 Store well in a sealed container for up to two weeks. Now that I’ve shared my favorites with you, I’m anxious to know: What sort of breakfast cereal would you make for yourself? Piña colada cereal with toasted coconut and dried pineapple? Cherry crumble cereal with dried cherries and cinnamon granola? A luscious combo of dates, coconut, and chocolate chips? An absolutely delicious granola to supplement your bran flakes. Again, don't be shy about doubling this recipe! optional: I toasted another 1/2 cup of sweetened shredded coconut to add in for sweetness, but that was before I’d tasted the cooled batch. It’s probably unnecessary. Pour honey mixture over the oat mixture, stirring well with a wooden spoon until fully combined. Spread this mixture out over a large sheet pan, place in oven, and bake for 10 minutes before stirring the granola. Repeat 10 minute baking time, followed by stirring, until granola is well-toasted (takes about 4 cycles, or about 40 minutes). Cool the granola on the baking sheet, stirring occasionally. 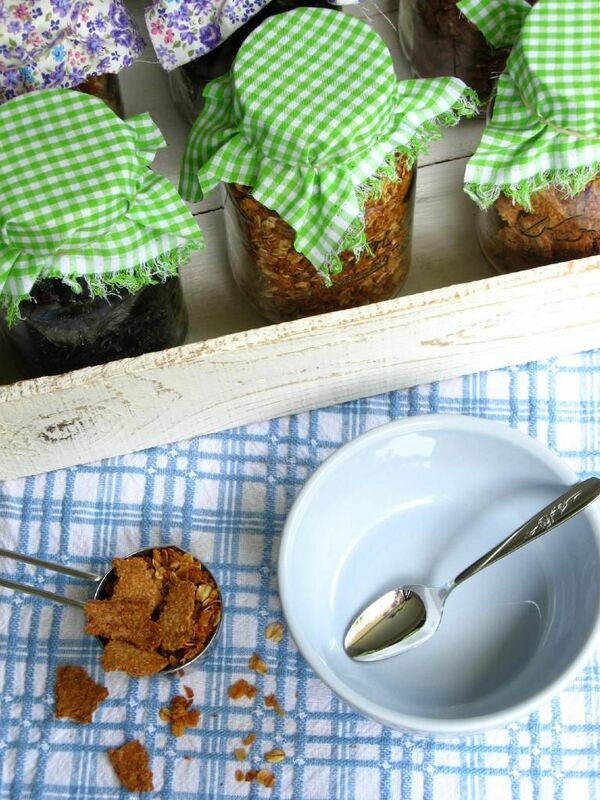 When cooled, you can store granola in an airtight container in the refrigerator for a few weeks, or at room temperature for two. Other delicious breakfast ideas floating around the internet right now: Beer Waffles with Cinnamon Cardamom Apples, S’mores Oatmeal, Oatmeal Pancakes, Pecan Sticky Buns, and of course, from yours truly, Carrot Cake Waffles. Note: I received the above mentioned products from Oh! Nuts free of charge to create these recipes. I totally agree, Courtney! This was my first try with granola, too, and boy, is it yummy. Did I miss something? I read 48 recipes but I only see 2, where are the other 46? Genius! I was expecting a huge list of links to a dozen or more websites but the combination of two recipes plus add in fruits and nuts is simple and perfect! Love it! Yum! I’m a cereal fanatic and the idea of making my own is awesome. I love what you did and too cool that you got to review oh nuts! I’ve drooled over their website on more than one occasion. I never thought of making my own cereal. Your cereal recipe sounds amazing, and looks so pretty too. How fabulous! 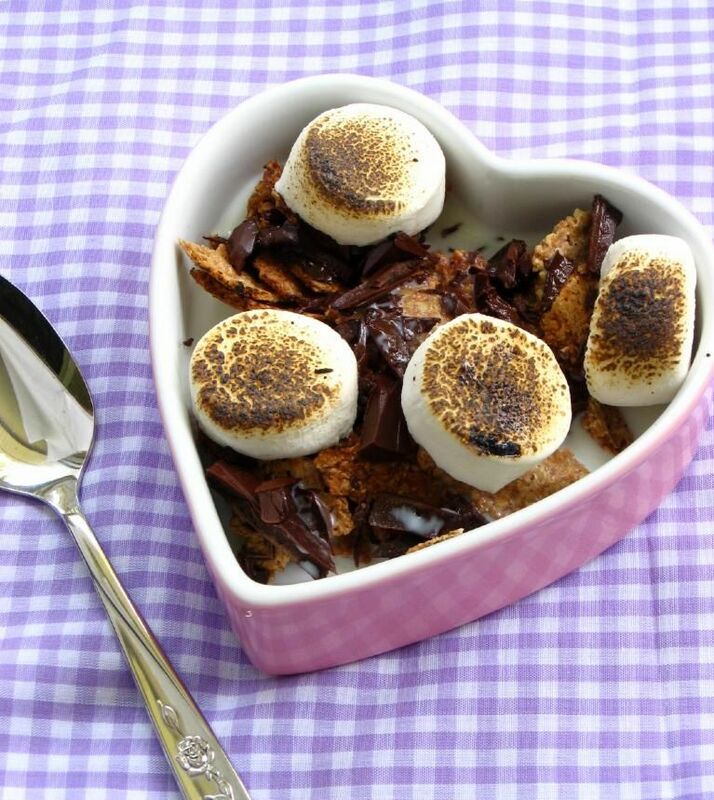 S’mores breakfast cereal! That’s one for the books … or the belly! What a fun read, smiled all the way through nodding vigourously in agreement. Nothing like homemade cereals with all those little extra ‘somethings’. I used to make my own granola from a Moosewood Restaurant cookbook. My favorite flavor was chocolate cherry: dried cherries and mini chocolate chips. I’ll have to try making those bran flakes. Bear eats cold cereal every morning. I think someone mentioned the Moosewood Restaurant Cookbook on LJ! Have to go check and make sure I’m not mixed up. Chocolate cherry sounds amazing! Oh Julie I so love your DIY attitude! Exactly how I feel! Thanks, Joanne 🙂 I think it’s spread through my family — my mom’s the same way (and my sister-in-law, too). I want to be a cereal woman too. It never occurred to me to make bran flakes, what a fun idea. My daughter might think I went off the deep end though. But I’m sure it’s fabulous. And I completely love that you made bran flakes, and I am going to make them. I think I would do the bran flakes and dried cherries… and I’m not sure what else yet. I’m kind of on a dried cherry kick. Yay! I hope you love them, Megan! It’s nice that they’re so simple. I’m wishing I’d made more . . . I love your idea of custom cereal! How practical to have a cereal buffet when there are lots of people in your house and everybody likes something different. I just started making my own granola this summer, but have never made bran flakes. What a great idea! This was my first granola, Betty, and it was definitely a good one! Now I’m a believer 😉 The bran flakes were so fun to make, too. Well look at you Cereal Woman making your own bran flakes. How cool is that? By the way, those cinnamon pecans sound killer! Thanks, Monica! Those pecans were soo good! Oh my… I am a cereal fiend, but I HATE buying it. The ‘good’ stuff is just soooooooo expensive…. Anyway, what I’m trying to say is that you are a genius. I can’t wait to try this and start making my own cereal! How awesome! I’ve never seen your blog before and I arrived here via foodgawker. I really enjoyed reading your post. I make my own granola but have never even considered making my own bran flakes. After reading your post I will have to give it a try. It looks amazing! I do think that I am going to have to try making cereal now. What stunning photographs! Brilliant! You rock Julie. I love it. Thanks, Andrea! The prices for the good, hearty cereal really are ridiculous. I knew the healthy bloggers would appreciate the nutritional info! 😉 Hope you love the cereal! That s’more cereal needs to get in my belly. Now. Thanks so much for the link. I had to read this post three times before I finally found it. I will try to return the favor. I do love your blog. Your photography is the best! What a wonderful idea, Julie, to make your own customizable cereals!!! I buy bran flakes all the time, but no more!! I’m gonna see if I can find some bran at the store so I can make those nutty bran flakes! Is the bran that I’m looking for at the store basically just a type of flour? Hurray! Do stop by and let me know how you like it, and what combinations you’re creating! Can’t say the thought of making my own cereal has ever crossed my mind, but this looks so do-able! Love the idea of customising your cereal and having such a variety to choose from. And the s’mores one looks super yummo. Thanks, Marisa! It’s really doable! I was just musing to myself during my morning drive that cereal is one of the few things that I love to eat that I have no idea how to make from scratch. Then today I stumble across this wonderful post. This is definitely going into my to-be-cooked pile. Thanks! It hit me like that, too, Wawa — “Wait a minute, I bet you can just MAKE that!” 🙂 Hope you enjoy it! That’s a great idea. Nice to know you can start off your morning without the chemicals/preservatives they put in commercially made. YOU are a cereal superwoman! And dare I say, a granola genius?! Not only is it a good & fun idea, but it is super cute too! I was pondering my cereal choices and wishing it were possible to diy. And IT IS. Whoop!! Yay for DIY! And I love that I’m Cereal Woman AND a Granola Genius — happy day! 🙂 Thanks! This is a great idea! As I was reading I thought, “This is a great idea for a brunch!” Then you confirmed my thoughts. I’m not sure if I’ll make my own flakes, but I will absolutely do the assortment. You’re so welcome, Towanda! The flakes are very easy, but if you wanted, you could also buy some plain bran flakes at the store and use those as a base for tons of mix-ins 🙂 Have fun! You are so innovative! And that S’mores cereal photo of yours…I think I could frame it, hang it on my wall and stare at it all day:) Delicious and gorgeous! Kudos to you! Lol you are a mad woman! But an ingenious one indeed! Hi Julie, I just wanted to let you know that I made some granola this morning and it turned out GREAT!!!! It’s truly the best granola I ever had!! Yayy! So glad you enjoyed it!! I loved it too. Can’t wait to go check out your post! My Bran flake stuck like crazy to the pan after the first time in the oven, and it was a big mess. Any ideas what for next time? Hi Kathryn! I’d make sure to roll it on the parchment paper like it says here — I could definitely see that happening! I’m sorry it didn’t work out! Do you think the dough for the Bran Flakes could be rolled thru a pasta maker? Well, it’d fall apart in the pasta extruder because it’s not your typical “dough” — like for scones or cookies. It’s more like a sort of compacted mush (ha!). Which, though it rules out the pasta extruder, actually makes it VERY VERY easy to roll. I’m not ever a fan of rolling either, but with this, you don’t actually even press down that hard — it’s more “spreading out the mush very thin” than it is ROLLING. I think that’s why the recipe has you start on the paper you’re going to bake it on, because you could never lift this thing. It’s not a cohesive dough-ball. But as for the question “jimvj” had – I’m also going to try putting some of the dough through a potato ricer to see if I can get the shape to come out sort of like Fiber One cereal, as that’s what began my homemade cereal search to begin with… making my own “Faux Fiber One” without aspartame in it. 🙂 I’ll let you know how it comes out! Ooh, let me know how it goes! Best of luck!! My husband always thinks I’m a hippie too. I like to make all those things that the cereal companies make, since they add way too many chemicals and unnecessary things to theirs. For an example, I bought Fiber One the other day, only to discover that it was sweetened with Sucralose. This is the only one in their line of products, sold at my local store, that isn’t sugar sweetened. Already made up my mind that I am not eating Sucralose (what started out as a pesticide recipe) on a regular basis. So….go you hippies! Home-made cereal is awesome! Hi! This is so wonderful! I’ve been inspired to start making cereal for my kids after watching “Food, Inc” and really having my mind taken for a ride! I just can’t feed my kids food with all those “extras” anymore. Nearly every cereal I saw today at the store listed “sugar” as the SECOND ingredient!! Yuck! I can handle the 2 TBSP your bran flake recipe called for. That’s awesome! As for the nut flour, though, I have no idea! This website suggested maybe coconut flour: http://www.elanaspantry.com/forums/topic/substitute-for-almond-flour. And this website says flax meal is a good substitute in a 1:1 ratio: http://www.ehow.com/list_7218851_substitutes-blanched-almond-flour.html. If you do find a good substitute, please let me know! I’m sure lots of folks with nut allergies would be thankful! SO glad I found this – I’m just now toying with the thought of making my own cereal, and I never would have even begun to imagine I could make my own bran flakes!! Cannot. Wait. to try this. I just found your blog and holy moly my friend, you are AMAZING!!! I make my own granola, crackers, kombucha, salad dressings, desserts, etc…but your cereal varieties take the cake! My mouth is watering just looking at the pictures. It looks amazing! I’m definitely going to try these recipes. My husband is undergoing testing for a heart condition and with all the additives that are in foods these days it makes you wonder if all this crap we are eating is really good for you. Also the fact that it is hard enough already to find food and other products we can have in our home because of the ammonia/ammonium allergy in household. You’d be surprised what you’re eating if you just take the time to read all the labels. Thank you for being a cereal woman!! Keep up the yummy goodness! I know what you mean! I’m glad this recipe might be helpful for your husband! I hope doctors get some clarity about his condition. Thank you, thank you , thank you. You so rock my world right now. I love it. You inspire women from all walks and make them want to make life better for them and there families. Thank you again. Aw, thank you so much, Lorrina! What a sweet thing to say! Wow! I’m so glad I found your blog! I’ve been looking for a recipe to make bran flakes for ages! We have many different food allergies and diet restrictions at our house and I have been looking for a way to customize things without spending a ton. I am dying to alter your recipes to make them gluten free. My kids will love having more variety to our cereal options! Thank you!! Hurrah! I hope everyone loves it, Valerie! So glad it’s helpful, Kali! I love that aspect of it — it puts you in control of your cereal choices! As for the cherries, do they have canola oil on them? I know raisins often have a bit of oil added (I’m assuming it keeps them from sticking together). I find that canola oil has a bit of an unpleasant, fishy taste sometimes. Oh, I didn’t check, but maybe they did! Thanks, Sarah! This is fantastic! I love cereal but it’s so expensive so have been looking up ways to make my own. I have one question though, how long will the bran and granola be good for? I’d like to make as large of a batch as I can and store it. Thank you so much for this recipe!!! We gave up packaged/processed foods a year ago, and enjoy much better health but miss cereal. I’ve been getting used to making so much from scratch, but hadn’t tried cereal until lately. My first couple recipes weren’t a big hit, but this one is LOVED by my whole family. Even my husband, the pickiest of the lot, says he’s in heaven because he can feel like he’s eating Wheaties again. Thank you! Charlotte, what a sweet comment! I’m so glad your family loves them! And what an inspiration, giving up processed foods! Kudos to you all!! Wow, this is what I love about blogs! I am so happy I’ve found your blog — my hubby is an extremely zealous cereal lover and eater of all kinds of cereal and in search for more and more!! I’m going to surprise him with your recipe! Thank you! Yayyy! I hope he loves it 🙂 You might want to double or triple the recipe so he can try lotsa combinations! Thank you soooo much! I thought I was the only one crazy enough to want to make cereal at home. I’ve been making granola for years but I’ve never been able to find a recipe for good old regular flake cereal. Love it! I’d still love to find a recipe for some “golden graham”-ish cereal for those unhealthy cravings. Maybe I could make a similar goop with graham crumbs and then I could make s’mores cereal! You read my mind! After finding the bran flakes recipe I started craving some good ole fashioned Golden Grahams. I would love to have a recipe for those as well! 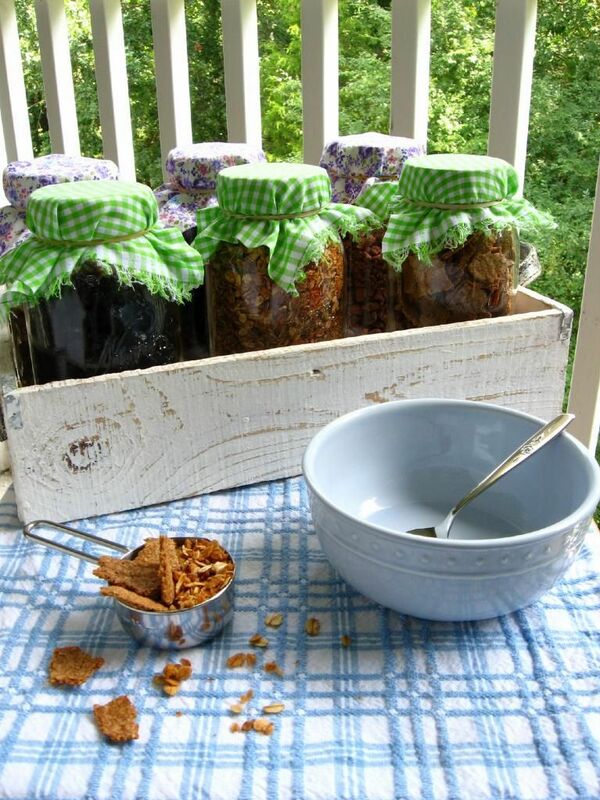 REALLY love this project of making homemade cereals! Where are there more? I personally favor the granola, though I have honestly taken to eating granolas strictly for dessert. Regarding this coconut granola, which does sound great, I would recommend using raw, unpasteurized honey, for added minerals/nutrients, and a low glycemic index, which makes a difference if you use if for snacking! But doesn’t baking it kill all of the raw honey’s good qualities? I’m new to raw honey, so I’m wondering. Anyone known any Gluten free flake type cereal recipes. I love Arrow Head Mills Organic Maple Buckwheat flakes, BUT not the $4.99 a box. I’m trying to make them myself with Buckwheat flour as a replacement four the other flours and or oats in some recipes that I’ve found here and on line. I would appreciate any help. I’m trying a gluten-free version of these just now! You can purchase certified gluten-free oat bran from Bob’s Red Mill, or use quinoa flakes in place of the oat bran here. A heavy gluten-free flour blend (brown rice & sorghum or buckwheat flour) would likely sub well for the whole wheat flour. That sounds awesome!! Let us know how it works out, Amy! Try using maple syrup instead of sugar! I just made these tonight because I’m a huge fan of the Maple Pecan Nature’s Path cereal, and they turned out *so well*. Yum, that sounds amazing, Alia! Can’t wait to try it! Thanks! Thank you so much For pursuing this dream and for posting it. I have been hunting for good cereal recipes for gluten free people like myself, this has given me the basics to make magic. So thanks again. I am using the basics of your bran flakes without the bran o wheat and making a vanilla coconut almond flake. Made with desiccated coconut instead of bran, and corn meal instead of whole wheat flour. Adding 1 tbls vanilla to the milk. What comes out is a beautiful cereal. Hooray! I’m so glad you were able to adapt it to suit your needs, Polly! Thanks for sharing!! Hi! This looks great! I was wondering if you know of anyone who has done this vegan and substituted something else for the milk? I am looking forward to trying this! Not that I can remember, but I bet a nice almond milk would work! Please let us know if you try it! Thanks, Theresa! Just made both of these recipes and am excited about the success. Next time I’ll definitely double the bran since it didn’t make that much. I only did the first cooking part in the oven and then finished it in my dehydrator. My granola almost burnt after 30 minutes, luckily I caught it at “just before burnt.” But I love coconut and this is a perfect topping for yogurt or cereal. What a fabulous idea! 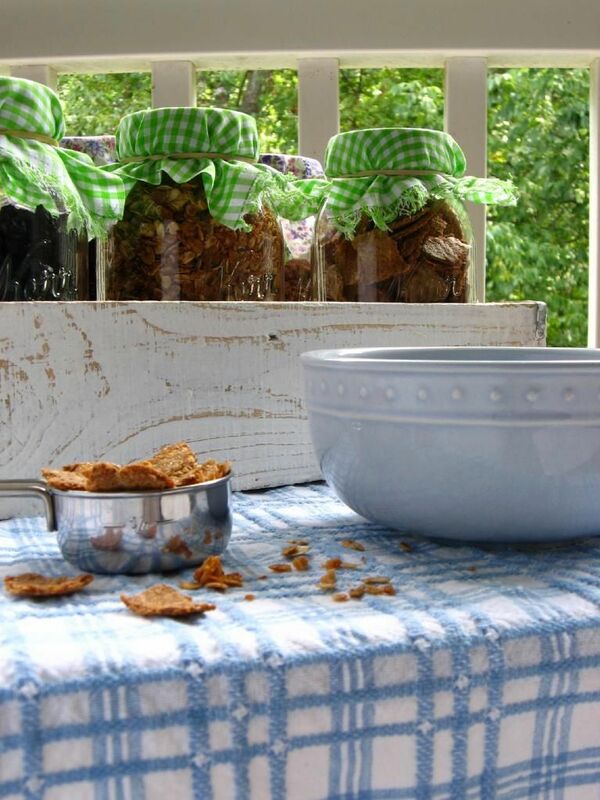 I have been making my own granola for years primarily for my husband. My boys were never great fans for it especially after the first few months. I do think having a variety of yummies at hand for them to choose from would definitely help. I love the bran flakes idea. Would anyone have any suggestions in how to make this gluten free or a recommendation of a substitute for wheat? I am trying to stay away from white flour. I’m not crazy about corn flour. I appreciate any advice! Thanks again for the great website! Yum! That sounds fantastic, Shauna! So glad you enjoyed it! Yum. Enjoyed the article about homemade breakfast cereals. I just wanted to ask whether you have a list of the add-ins such as fruits and nuts etc that you combine to make the different cereal varities. Need some ideas. 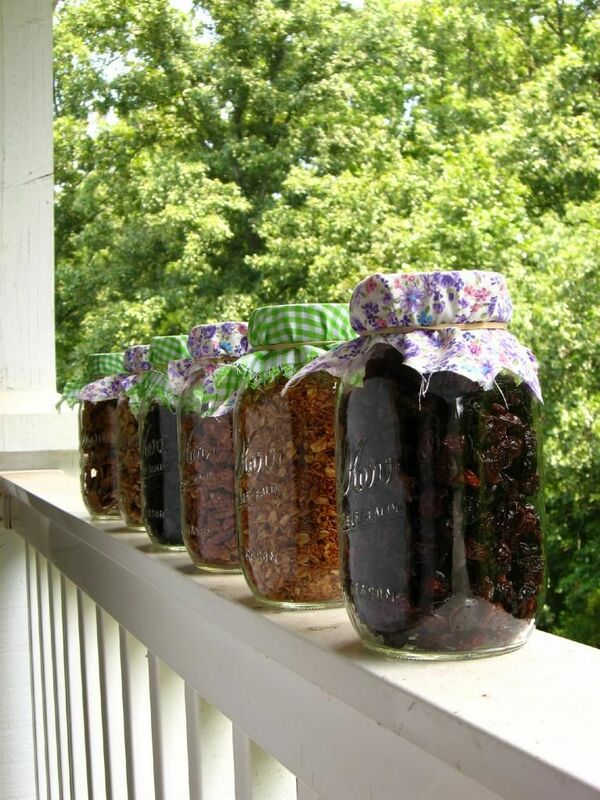 Tresa, I used dried blueberries, dried cherries, nuts, granola, chocolate chips, and marshmallows for mine — along with the bran flakes. Hi Beth! I buy Bob’s Red Mill Wheat Bran and I find it in the grocery over by the flour (or sometimes near the organicsy section if they have one): http://origin.kaboodle.com/hi/img/b/0/0/185/e/AAAAC5TCRmsAAAAAAYXokA.jpg?v=1315840416000 If you can’t find it, check a fancy or health-food grocery and they might be more likely to have it. By the way, I use almond flour made by the same company, found in the same place! I am a mom of a large family and breakfast cearal is a luxary for us. I do make my own granola (among many other things) but bran flakes isn’t something I’ve done. Im so excited to try it. I’m going to put dried fruit and nuts in separate containers and set up a cearel buffett in the mornings. Everyone can “build” their own cearel!!!!! I’ve been already making my own yogurt and now it’s time for cereal!!! yeay!!! I hope you love it!! Especially if your house is big on cereal, you might want to multiply the recipe a few times to make enough. Enjoy!! Hey!! Love this idea!! But My bran flakes were still a little chewy…any recommendations? Yep! Spread them back out on the pan and keep toasting until they crisp up — make sure they’re not overlapping on the pan. Then let them cool completely without piling them (so they don’t steam each other). That should help! Ahh yum I love combining cereal! Just wondering for the bran flakes, is the sugar necessary? I’m trying to reduce my sugar intake. Thanks!! I think you can leave it out! Let me know how it goes! I just tried making the bran flakes…mine stuck to the parchment paper. Very frustrating. Any suggestions to keep it from sticking? I did grab the wax paper instead of the parchment paper….oops! That’s what I get for being in a hurry! The ones I were able to get off the wax paper were delicious though!! Next time I will remember to slow down! 🙂 Thanks! Absolutely! I have TOTALLY made that mistake before! Hate that that batch didn’t work out, but I’m glad you enjoyed them! Thanks so much for the bran flakes recipe! I tried it for the first time 2 weeks ago, and my family loves them so much, I’ve made them 4 times! We’ve been easing into eating less and less processed foods, and I was really afraid to have unprocessed breakfasts, because I love cereal so much, but these are great. This is the first recipe of yours I’ve tried, and I can’t wait to try some more. I’m so glad to hear that, Vincent!! Thank you for trying it out! This looks so wonderful. I can’t wait to try it! As for Smores cereal, did you know you can make your own marshmallows? I’m sure you could cut them smaller to make them more cereal friendly too. I haven’t tried them yet but I have read that you will never eat store bought marshmallows again. 😉 Just look up homemade marshmallows on the web, I’m sure you will find them. 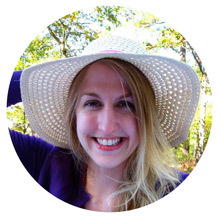 Your blog is beautiful and deeply inspiring! Keep cooking:) I can’t wait to make the cereal!!!! This is a fantastic idea! I am all about making my own everything. Glad I found your blog! I’m glad you did, too! Hope you enjoy! Hey Julie, i made both the bran flakes and granola. They turned out oh so yummy and satisfying. Just like you, one morning while eating my cereal I had the idea of making my own cereal. The search got me to your website and I am glad I tried yours. I am not going back to store bought cereal. Thank you so much. I can’t stop eating the first batch that’s cooling while the second batch is in the oven!! So delicious and they’re not even done yet. Thank you! 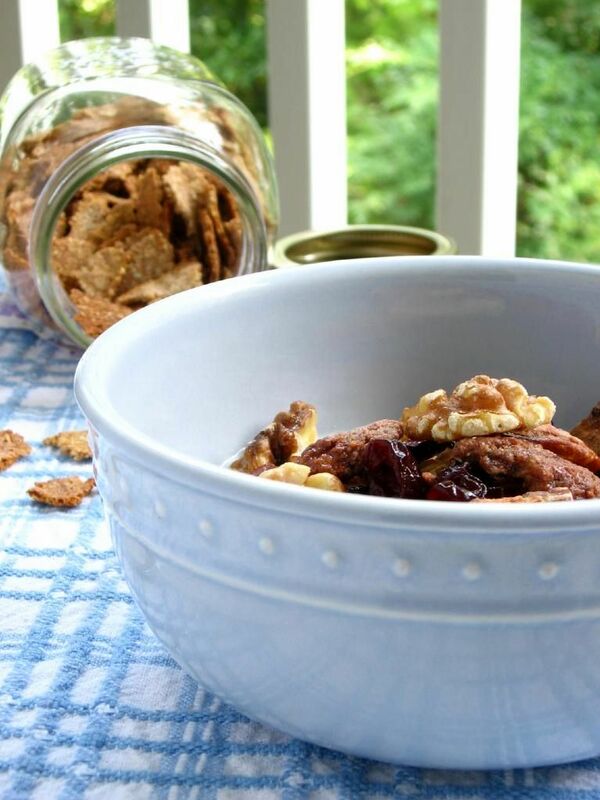 As I mentioned in the post: “If you have just 2 dried fruits and two nut options along with your flakes and granola, you’ll have 48 possible breakfast cereal varieties — that’s a lot of options!” The 2 recipes here are for the granola and bran flakes. If you pick up a couple of your favorite add-ins (nuts, chocolate chips, dried fruits, fresh fruits, etc. ), that’s how you can combine them differently to make dozens of varieties. So I might have missed something, how do you make Smores cereal? Great post! Way back over 10 years ago when I first got married, I lived 30 minutes from the nearest store. 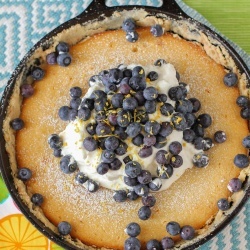 I was a new stay-at-home housewife and I wanted to make EVERYTHING from scratch. I tried making cereal, and after a couple of failed batches I quit. Now it seems like there are more and more homemade cereal recipes circulating. I thank you for going through the time and effort to perfect some good recipes. Thank you!! Maybe now I can finally get some good cereal. The s’mores cereal is just the bran flakes with chocolate and toasted marshmallows 🙂 I hope you enjoy! I think your nutrition information is off for the granola. If that recipe makes 3 cups and a serving is 1/2 cup, there are 6 servings. With a teaspoon of kosher salt in there, there are at least 400mg of sodium per serving, not 122 as stated. Some of us are on restricted sodium diets and keeping the sodium content accurate is crucial. Other than that this sounds really good! Thanks for the correction. I provide nutritional info only as a courtesy, but I use SparkPeople to find it and am not certain of its accuracy. Hope you love it, Julianne! I multiply the recipe when I make it because it goes fast and doesn’t make much. OH so good though! *Bran* cereal. Autocorrect gets too helpful at times. I know I’m a little late jumping on this comment thread but . . . Thank you! Thank you! I got up this morning and decided to give my kids cereal for breakfast. Read through the ingredients of the three store-bought cereals my husband brought home. Two had corn syrup and the third had BHT in the packaging. I had to pick what I felt was the least chemicaled and the lesser of three evils. I thought “There’s got to be a better choice than this.” So I went online and lo and behold, I found this blog post. Thank you again! Do you think the Bran Flakes would stay fresh longer if they were kept in the fridge after they cooled? I’m interested in trying the recipe (I’d like to make a big bunch of it, in fact), but I don’t like the idea of doing all that work and then only getting 2 weeks of mileage out of it. I guess it’s the nuts in the recipe, especially, that would go rancid in the pantry after they’d been toasted. Any thoughts? Honestly, I’m not sure — that might affect the texture. You can certainly give it a try (maybe even freezing the flakes?) This recipe as is is probably about 1 week’s worth (with granola, etc. to supplement). If you try it, let me know. Wow, the bran flakes making sounds so very interesting. Did you ever try or consider making it in a grill/panini maker or even a crepe maker? Thanks, Fatima! With this mixture, that wouldn’t work. It doesn’t form a dough as much as it forms kind of a loose mush that you roll into a flat layer. You couldn’t transfer it to a crepe maker or anything. The first bake is really dehydrating it to a layer that you can then bake and crisp, and perhaps for that step you could try another cooking method, but at that point the oven also seems easiest! Hi Julie; well I have never commented on a site before but there is always a first time – just like making your own bran cereal! I love a little crunch with my fruit and hate what they put in cereals so decided to give this a try. Thank you so, so much. Because I have cut out almost all wheat from my diet, I substituted with spelt bran, almond and brown rice flour and 1/3 cup of ground sunflower seeds and ground cashews combined. It worked! I would like to know what you think of using coconut flour instead. Do you think it would absorb the milk and water too much and make it pasty? Thank you once again. I am thrilled! Hooray! I’m so glad to hear that it worked, Joan! I wish I knew an answer to your coconut flour question, but I’m not sure. I’m betting there’s some combo of coconut flour and ground nuts that would give you a great texture! If you try, please let me know! Thanks Julie, my second attempt was using a mixture of unsweetened coconut, brown rice flour, rye flakes and plain flour to make up the one cup of dry ingredients and then added the remainder of your recipe. I also took a suggestion from another reader and put in 2 TB of maple syrup instead of the sugar plus 1 tsp of vanilla in the milk. The flakes turned out wonderful and it just goes to show you there are endless possibilities to this recipe. No more store bought cereal for me! Thank you so, so much. I am so glad I found this site. And once you know what you are doing, it is so easy. Next time I will try it with the coconut flour and let you know. Oh my gosh, I love your bran flakes cereal recipe! I admit I changed it some to fit what I have on hand and I substituted Corn meal, Spelt and Buckwheat flour for the bran and added cooked whole millet and it is soooo tasty! Turns out my rolling pin was to big to flatten out the batter on my cookie sheet so it took like an extra hour to cook but it eventually turned out crunchy and delish! Thanks for the base recipe! I just made your bran flakes tonight and they are fabulous. I can’t wait to try a couple other variations with seeds or something. Who knew one can make their own bran flakes??!! Yay!! Thanks, Sherry! 🙂 So glad you enjoyed them! This looks great! I love making most things at home and I’ve yet to try cereal (other than granola). For the Homemade Nutty Bran Flakes recipe is bran the same as wheat bran? Excited to try this! Hi,I don’t see 48 breakfast cereals I only see 3. Where’s the 44 breakfast cereals? Hi C, the idea is that using the recipes and tips here, you could combine ingredients to make 48 different breakfast cereals. It was a fun way of explaining the customizability of the bran flakes, granola, dried fruit, nuts, and other mix-ins. Oh,i see so is this like the have it your way Burger King kind of cereals? I love both these recipes. Thanks so much for sharing! I just wanted to add a couple comments that make things a bit easier — I use silpat mats in my baking sheets, then instead of using any parchment paper, you can just glop the dough right onto the silpat in the baking sheet, flatten it out slightly, cover with plastic wrap and finish rolling it out with a small “pizza dough roller”, while still in the pan. Then peel off the plastic wrap and stick it in the oven. I also didn’t find any need to stir the flakes during the second baking, if using convection. Also, for the granola, I had to reduce the salt to 3/4 tsp or it was too salty. Again, cooking on convection, I only had to stir through it once during baking instead of every 10 minutes. Hope this helps somebody! 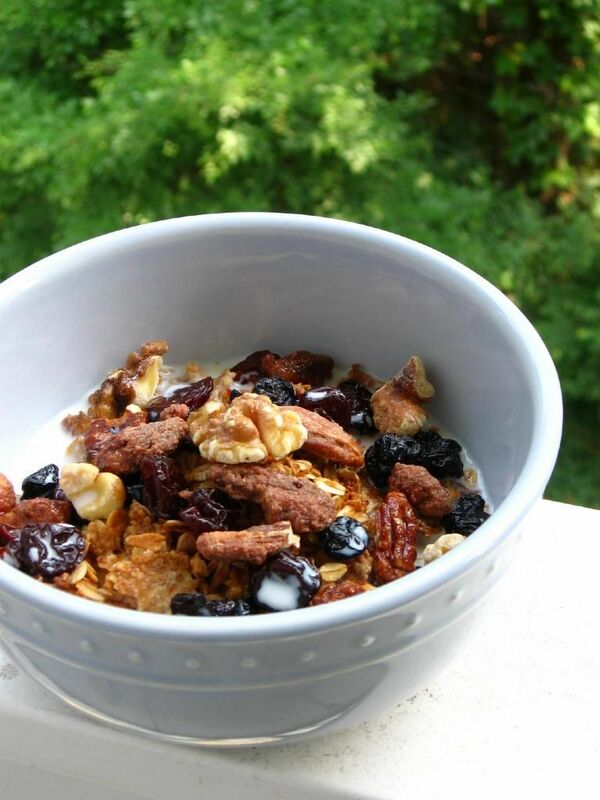 A grain-free, low-carb, healthy granola recipe! Almonds, coconut, and cinnamon make for a wonderful combination of flavors for breakfast! Any way to get rid of the nuts? Would seed flour work? I’m looking to make my own cereal because I’m slowly developing allergies to everything delicious in this world.